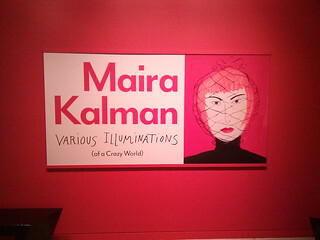 Image: "Maira Kalman at the Contemporary Jewish Museum" Courtesy of Susan Magnolia. Video: Illustrator Maira Kalman Explores Art and Existence by thinktv. Nice video where Kalman gives biographical info as well as some insights into her work. Image: New York City Public School 47 Library. Still of "Maira Kalman's Library Art" Courtesy of the Robin Hood Foundation. 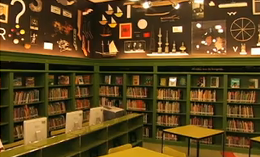 Video: Maira Kalman's Library Art by RobinHoodFoundation. What an awesome initiative! They've created some beautiful, inspiring school libraries. The L!brary Initiative, a partnership of the Robin Hood Foundation and the New York City Department of Education, with support from the Mayor, corporate donors, and a team of architects, seeks to reverse these patterns of low literacy skills and underachievement by working with community school districts and public elementary schools to design, build, equip, and staff new elementary school libraries. Image: Image of "Shhh" Courtesy of UCLA. Video: Walnut Creek Library Art Time Lapse by CityofWalnutCreek. I wonder if Moeller or the City of Walnut Creek chose the subject's "shushing" pose. While I respect Moeller's ability to create visually striking art, I was disappointed to see the final product--an image that reinforces the stereotype of librarians as "bespectacled, bun-sporting ladies who shush patrons." Image for the Milner Library site at Illinois State University. www.mlb.ilstu.edu/ressubj/speccol/lenski/Welcome.html via Lifeonthecutoff Blog. Video: Meet Lois Lenski by Open Road Media. Nice video with biographical details. [Not mentioned...she's an Ohio State grad! ] More about the e-books can be found here. 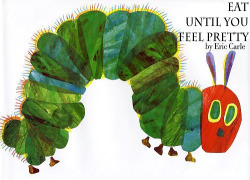 Image: Retitled "The Hungry Catepillar." Video: OSU Billy Ireland Cartoon Library & Museum. This weekend over 6,000 riders will ride from Columbus in an effort to raise funds to benefit The Ohio State University Comprehensive Cancer Center- James Cancer Hospital and Solove Research Institute. I humbly ask you to support my effort to end cancer. My grandmother, two of my grandfathers, and my father all had cancer. Cancer will continue to deeply affect our families if we do not stop it. Together we can end cancer, but our financial support is absolutely vital. I ask that you consider a twelve dollar ($12) donation of which 100% goes directly to cancer research at the James. Cancer knows no strangers: my hope is that Pelotonia knows none, too! Thank you for your consideration of this request and I'd be grateful for your participation.